When you buy a Certified Pre-Owned Subaru from Carlsen Subaru, you can have peace of mind that your Subaru is ready for all new adventures. 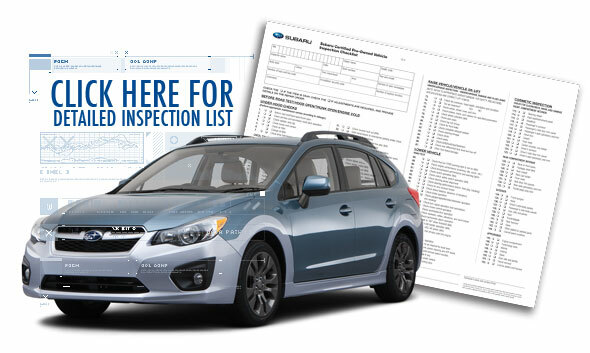 Each Certified Pre-Owned Vehicle endures a rigorous 152-point safety inspection. We hold our Certified Pre-Owned Vehicles to the highest of standards, so if we find a problem or an issue, it will be repaired or replaced by genuine Subaru Technicians. 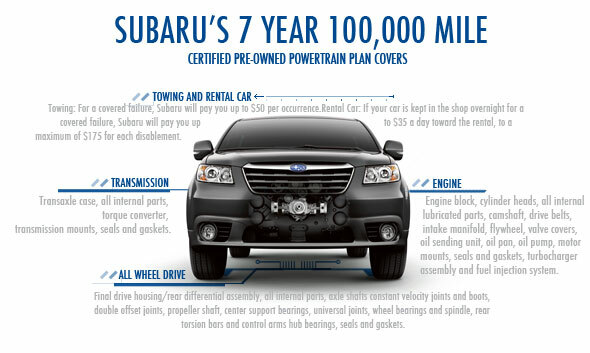 Each Certified Pre-Owned Subaru comes with Subaru's 7 Year/100,000 mile Powertrain Plan. From engine parts such as the cylinder heads to fuel injection system, to the Transmission and All-Wheel Drive systems, this plan covers it all. The parts of the engine that are covered under the Powertrain Plan include the engine block, cylinder heads, all internal lubricated parts, the camshaft, valve covers, oil pump and pan, the oil sending unit, the motor mounts, drive belts, flywheel, intake manifolds, all the seals and gaskets, the turbocharger assembly and the fuel injection system. The parts of the All-Wheel Drive system that are covered include all the parts of the final drive housing/rear differential assembly, all internal parts, double offset joints, universal joints, center support bearings, wheel bearings and spindle, constant velocity joints and boots, axle shafts, propeller shaft, rear torsion bars and control arms, hub bearings, and the seals and gaskets. All internal parts of the transmission, the transaxle case, the torque converter, transmission mounts and all the seals and gaskets are covered under the Powertrain Plan. Subaru will pay up to $50 per occurrence for towing if the failure is covered. If your car needs to be kept in the shop overnight for a covered failure, Subaru will pay up to $35 a day for the rental, up to a maximum of $175 for each disablement. 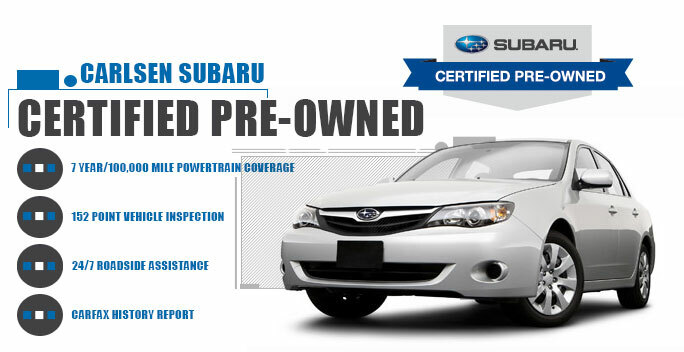 If you're looking for even more coverage on your Certified Pre-Owned Subaru, you can upgrade to one of two additional comprehensive coverage plans. The cooling and fuel systems, which include the radiator, water pump, fuel lines, fuel tank, fan motors, heater core, engine fans, and the fuel sending unit will be covered. This covers the steering rack assembly and all the internal parts, including steering column shaft and coupling, power steering pump, the universal joints, and the seals and gaskets. The coverage on the front suspension includes the MacPherson struts, transverse link control arms, shafts and bushings, wheel bearings, steering knuckles, ball joints, stabilizer bar and bushing, and the seals and gaskets. The A/C compressor, compressor seal and receiver/dryer, condenser, evaporator, expansion valve, blower motor, and clutch and pulley are all covered. Under the Classic Plan the electrical parts and systems covered are: alternator, voltage regulator, starter motor and solenoid, engine management control unit, analog dash gauges, trip computer, clock, heater blower motor and switch, manually operated switches, digital instrumentation cluster, horns, window regulators, speedometer head, the motors for the power windows, the windshield wipers, the power mirrors and the sunroof, wiring harnesses, ignition coil, power door locks, and electrical relays. This includes the Master cylinder, wheel cylinder, hydraulic lines and fittings, Anti-lock Brake System (ABS), Incline Start Assist, the Traction Control System (TCS), disc brake calipers, the power brake assist unit, the and the seals and gaskets. The Subaru Gold Plus Plan is similar to the manufacturer's bumper-to-bumper coverage. It offers the Best Bumper-to-Bumper Protection. It not only includes everything listed under the Powertrain and Classic Plans, but it also covers a wide range of additional components. In fact it covers so much that it makes more sense for us to name just a few things that are and are not covered under the Gold Plus Plan rather than listing everything. Some of the components not covered under the Gold Plus Plan are brake disc/pads, clutch disc, wiper blades, light bulbs, and routine maintenance items. Refer to the contract for details. Some of the many components that are covered under the Gold Plus Plan include: cruise control, radio and speakers, seat belt assembly, gear shift levers, hand brakes levers, cables and latches, seat releases, rear window defogger, thermostat, springs, pedals, locks, heater and a/c vents, engine brackets (including power steering), window tracks, guides, handles and knobs, wiper arms, frame, floor boards and body joints, O2 and knock sensors, power seat motors, CD player, DVD player and navigation system. If your car is being serviced for a covered repair, or after the warranty period and needs to be kept in the shop overnight, the Gold Plus Plan will pay up to $500 towards your actual expenses for lodging and meals for you and your family if the breakdown occurs more than 50 miles from your home. If necessary, Subaru can assist you in locating a nearby hotel, a rental car company, or travel agency. Should your tire become damaged from potholes, nails, glass and other road hazards that are not covered by the tire manufacturer's warranty the costs are covered by the Gold Plus Plan. The four original tires on your vehicle are covered for repairable leaks or punctures. The plan will cover the prorated cost up to $300, if a tire replacement is necessary. Subaru's 24-hour roadside assistance includes emergency dispatch towing for covered warranty or Added Security breakdowns. Emergency on-site road service for jump start, delivery of gasoline, a tire change with your good spare, and other minor repairs. It also includes the service of "Sign and Drive" up to $100 per disablement to get you back on the road as quickly as possible with no out-of-pocket expense. Emergency lockout or locksmith service, computerized trip routing and much more.